Adjacent to the main hotel, Aberlour is a superking garden suite with premium pillows and soft white cotton bedding, dog bed and bowls. 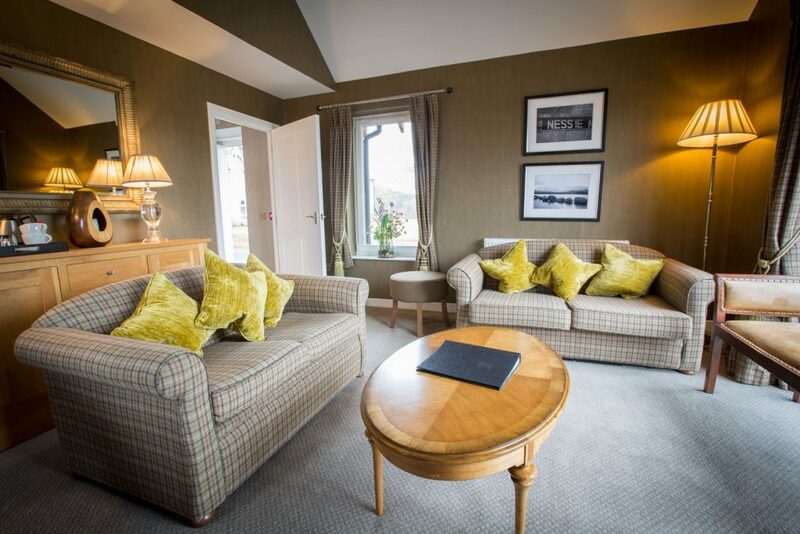 Located in the steading a short walk from the main hotel, overlooking the gardens and the Cairngorm mountains. Warm neutral tones and rich Highland plaids are the hallmark of the Aberlour suite. Bedroom, bathroom and lounge with 2 relaxing sofas with coffee table help to create a rich and relaxing experience for your well-deserved break. The porcelanosa-tiled bathroom with chrome fittings offer a contemporary haven for bathing. Relax in the bath or overhead shower using our range of Highland Soap Co handmade toiletries made with essential oils such as wild nettle & heather. Dry yourself with thick, fluffy towels and then don a super-soft towelled bathrobe. Enjoy in-room entertainment with wifi access and TV. Equipped with hairdryer, condiment tray, iron & ironing board, and safe.